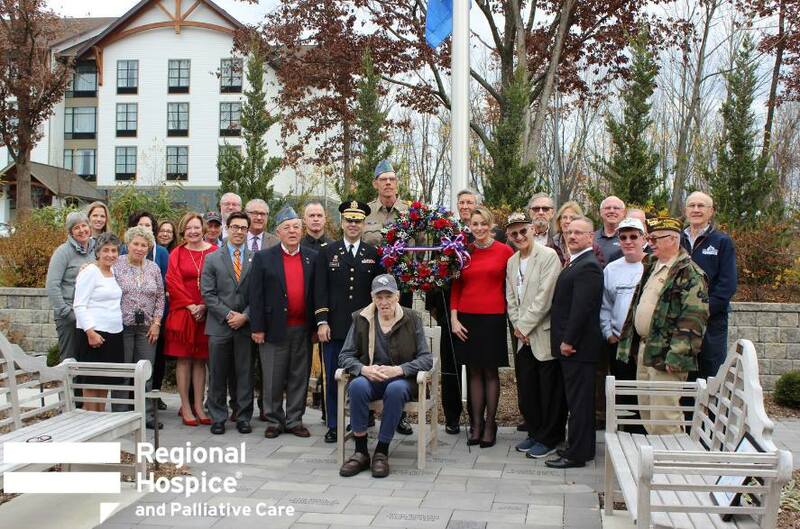 On the morning of Friday, November 9, 2018, Regional Hospice and Palliative Care (RHPC), hosted a Veteran’s Day event which was attended by local politicians, RHPC’s veteran volunteers, staff members and patients. It was a moving commemoration of the invaluable contributions made by veterans to our country and a testament to the strength and will of the human spirit. During the event, Tom Saadi, The Connecticut Commissioner of Veterans Affairs, gave an emotional speech of gratitude to all of the Veterans in attendance. He presented the veteran volunteers of Regional Hospice and Palliative Care with coveted armed forces challenge medallions from the Veteran’s Administration. Saadi also spent extra time with two veteran patients who reside at the Center for Comfort Care and Healing, presenting them with coins and saluting them for their service to our country. One patient, Emanuele George Sabino, expressed how honored he was to be recognized among this group of individuals who have so loyally served our country. RHPC was also commemorated on Friday morning, as Roy was presented with the “We Honor Veterans” Level 4 Award*, presented by Mary Beth Hickey, Director of Volunteer Services. The prestigious honor is the highest designation in the program, awarded to RHPC for its continuing dedication to ensuring local veterans have access to high quality end-of-life care. Regional Hospice and RHPC Board Member and veteran Don Smith spoke about the incredible ways that Regional Hospice provides caring end-of-life support to all members of community, and remarked about the sensitivity shown to veteran patients and relatives in particular. To commemorate the day, a wreath was placed at the flagpole at RHPC in remembrance of all their veterans who have served and died for this country. Volunteers who have served in the military have the unique ability to relate and connect with our veteran patients and their families, sharing a common language, code of conduct and sense of honor.